I have always wanted to make a Hawaiian quilt or pillow, but I find the time consuming process rather daunting! 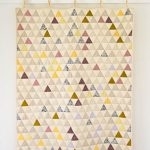 Nonetheless I have always kept making a Hawaiian quilt in the back of my mind as a goal and inspiration. Recently I started thinking about a way to simplify the process and our wool felt popped into my mind. You don’t have to hem felt which cuts out the laborious hand turned appliqué step and we recently started carrying our beautiful wool felt by the yard so I could make my piece as big as I wanted. Our 100% wool felt comes in the most luminous, saturated colors and each bolt is two yards wide (yes, two yards wide!). I picked out two of the most vibrant colors I could find and made these two huge floor pillows. The floral shape is stitched onto the background with bright yellow silk and wool Trio needlepoint yarn. Creating these two pillows was so much fun! The felt is beautiful and easy to work with and the whole thing came together so fast. I felt like a painter making big colorful gestures. 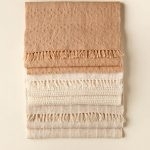 2 yards of Global Weave Linen in Natural or (if you’d prefer a brighter backing fabric) 2 yards of Essex Linen Cotton. Two 36-inch by 36-inch pillow forms. We found some available here. A Hawaiian Pillow Template printed (available for free download here), cut out, and taped together at corresponding numbers. Cut each piece of felt into two 36-inch squares and put one of each color aside to use for the next pillow. 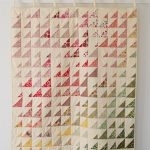 Fold the square of Color A vertically and horizontally into quarters and iron it to mark the creases. Unfold it and then fold it into quarters diagonally and press those creases as well. Unfold the piece and lay it flat. It will now have 8 marked segments. If any of the creases are unclear take the time to re-press them before you move on. Hawaiian pillow template. Place the template along the edges of one of the eight marked segments as shown above. The long part of the template should be along the diagonal marking and the short side should be on the vertical middle marking. Using the tailor’s chalk trace the template carefully. Then flip the template over and move it clock-wise so that it is now in the next segment with the long part of the template along the diagonal marking and the short side along the horizontal middle marking. Trace the template in its new position. Keep flipping the template in this manner until you make it to all of the eight segments. Make sure that your piece looks like a cohesive shape before you cut it out. Carefully cut out the marked shape. Fold the square of Color B into quarters just as you did for Color A. You do not need to fold it diagonally as well. Using bent arm safety pins pin, the shape into place around the shape’s edge and middle. Cut an 18-inch length of the Trio thread. Separate it into three pieces of 2-strands each. You will use 2 strands for all of the hand stitching in this project. Using a small running stitch sew along the edge of the shape taking out the safety pins as you come to them. Sew around the entire edge of the shape in this manner and you’ll be done with the top. Repeat all steps for the second pillow but use Color B for the shape and Color A for the background. Cut the Linen Cotton into two 36-inch squares. 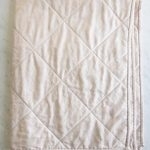 Pin a linen cotton square to one of the pillow tops, right sides together and then, using a sewing machine, sew them together with a ½-inch seam along three sides. Turn the pillow case right side out through the open side. Slide the pillow form into the pillow case through the open side and then the sew the open side shut with a slip stitch. Looking forward to making these! Thanks for the wonderful tutorial. Minor feedback; In finishing the pillow you mention linen cotton but do not list it under materials. Thanks for catching that Alexandra- it’s been corrected! wow! those are beautiful! 🙂 I love that they are gigantic!! imagine having a pillow fight with them!! I like so much!!! The colours are beautiful. These are beautiful. I have some wool felt I’ve ordered from The Purl Bee. These look fantastic. Can’t wait to try. What did you fill the pillows with? This is a great tutorial. I love the colors too. These are wonderful! I do Hawaiian quilting and these really appeal to me! Can you give me a ballpark estimate about how much they cost to do? Mahalo! Wow. Gorgeous. And a very clever way to create the templates. I recently made a felt suzani pillow but did not have the patience to do applique (I just glued the felt on.) Very inspiring. These are such a great idea, and what a color blast to add into your room!! These are so pretty! I've always wanted floor pillows but haven't found any in the color and pattern combination that I like – until now! One question – I don't have a sewing machine – do you think it would work to hand-sew the front and back together? I have no sewing experience so I don't know if hand-sewing would cause a problem as opposed to using a machine. It would be fine to hand sew the front to the back. You can follow the directions in exactly the same manner. A question: How do you clean these pillows? It seems that since they are floor pillows they will need to be cleaned at some point. Put a zipper on one side, and you could clean the covers?? If you attached a zipper or buttons you could hand wash the covers. This isn't related to the pillows, although i love the pillows, but i was wondering about the paint color on your walls. Would you by chance know the name of it? It's beautiful! Actually that is Joelle's wall and the paint color is Benjamin Moore, #974. It's one of their old colors, before they had names, but they can still make it. I really love these pillows! I currently live in Hawaii and would love something like this in my living room. Thanks so much for sharing! This project addresses a long time idea I've had to have a large size wall hanging of a poppy or other dramatic flower in a vibrant color. Do you have any ideas on how I could make a template like that? Or do you have one? Also what colors does the wool come in? Love the pillows, this have to be my next project:) How much did it cost you to make these? So that would be $172.66 for the fabric and yarn, or $143.66 if you used the Essex as the backing fabric. Thanks for writing in and please let us know if you have any more questions. These are just beautiful.Thanks for the instructions! Those floor pillows are very lovey. I was wondering do you have a video tutorial. I know someone asked prior to me but can you actually hand sew the fabric to make a floor pillow. One more thing instead of purchasing cushion can you combine two pillows instead? You can hand sew these- it just takes a bit longer. I'm not sure what you mean by combining two pillows? In order for the floor pillow to be nice and flat and look neat it would be best to use just one pillow insert. So, in short: Wonderful idea. Great pattern! Do you sell the finished pillows? I'm not a craft person but I would love to have these. We don't sell the finished pillows but they really are simple to sew! Sure! That would work fine! I love these pillows and wanted to make them for my friend who is moving to Florida, but I did not see the lovely bright colors. will you be getting more in soon? Thank you! Unfortunately we no longer sell felt by the yard in very many colors. I’m so sorry! We do have it in 18-inch square pieces if you’d like to make a smaller version. Thank you so much for writing in and for making us aware of the issue! We have corrected the problem and the images are back up!